Injuries and accidents at work are very common. They may occur in any job, in any situation or at any time. Whatever your job is, your employer is under a duty to ensure you are safe. At Bloomsbury Law, we have dedicated personal injury lawyers who deal with all types of accidents which occur in the workplace. Our specialist lawyers can also help you make a compensation claim if you have been involved in an accident outside of work. We are equipped to deal with every type of personal injury claim from stress at work to major life threatening injuries. All employers are obliged to comply with Health and Safety Laws and Regulations. They are required to provide their employees with a safe and accident free working environment. However, this is not always the case. If you or a family member has had an accident as a result of your employers’ negligence, you have a right to claim compensation. If we can prove that your workplace injuries were caused as a result of your employer’s negligence, we will be able to assist you in making your claim for the injuries you have suffered. We have successfully helped many clients to claim compensation for a range of workplace injuries and illnesses. It does not matter how small they are, we will do our best to ensure you receive the best possible compensation. We are able to advise you on all types of jobs, ranging from manual work to office work. No matter the type of job, the employer has a duty to ensure you will not have an accident at work. Where the employer has not complied with the health and safety regulation, we can assist you in your claim. Employers are under a duty to provide employees with adequate protection from risks, such as burns, scars and lacerations. These injuries are usually sustained by those who work with chemicals, electronics, machinery, and kitchens. These injuries can be very severe and in extreme cases, cause death. Whatever the injury you have suffered, our lawyers can provide you with the guidance you need to make a claim against your employer. It is fairly common for employees to be injured by falling objects. Being struck by falling objects can cause serious injuries at work. Your employee is obliged to make the environment a safe place and ensure you are adequately protected from falling objects. If your employer has failed to provide such protection or has not provided enough protection, you could be entitled to make a compensation claim. Many accidents like this occur in the UK due to negligent employers. There is a particular high risk when those are working on construction sites, warehouses or those who clean and maintain outer parts of offices. These falls could be devastating, and can cause very serious injuries or even death. It is the employer’s duty to ensure employees are safe when working at a height. 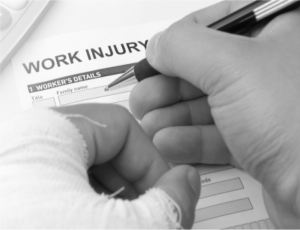 If you have been injured, even if it is a minor injury, your employer could be at fault. Our lawyers offer the highest level of sensitivity and efficiency when dealing with these claims. We always do the best we can to ensure you are compensated. This is a safeguard for those who work in hazardous work environments as part of their job. It is the employer’s duty to provide employees with the protective work equipment to protect them from the possible injuries they could be faced with in carrying out their jobs. Protective equipment could include hard hats, protective goggles, high visibility jackets, steel cap boots or breathing apparatus. If you feel your employer has not provided sufficient protective equipment that should be worn whilst carrying out your job, you may be able to claim compensation for your accident. An employer has the responsibility to provide employees with sufficient protection from any risks that could result in back, neck or spinal injury in the workplace. Where the employer has failed to do so, they put their employees at risk of significant lifelong injuries. If you have been a victim of any such injuries at work, you could be entitled to make a compensation claim. Employers are under a duty to provide its employees with a safe working environment. Employers should ensure that there are no hazards such as; uneven floors, wet floors (which are not immediately cleaned) and dangerous obstructions to daily use of the work place. If you have slipped, tripped or fallen at the work place as a result of your employer’s negligence in making the work place safe, you could possibly make a claim for compensation. A lot of employees have been required to work in environments where the noise level has had an impact on their hearing. Employers are required to provide their employees with adequate protection against high noise level. However, where they fail to do so, this can leave employees with irreparable damage to their hearing, and in serious cases, complete loss of hearing. If you’ve been exposed to a very high level of noise which has damaged your hearing during your employment,our lawyers can help you make a hearing loss claim. If you have been working in a workplace for a long period of time and now find that you suffer from hearing a permanent buzzing or noise, you may be suffering from tinnitus. If this has been caused by your working conditions, you may be able to make a compensation claim against your employer. Fractured bones can occur as a result of negligent employers. Employers are under a duty to provide employees with protection from risks arising from the daily work routine. When that protection is not provided and a fracture injury is incurred by the employee, a compensation claim may be brought. If you are a victim of your employer’s negligent, our lawyers can offer you the highest level of professionalism and expertise, combined with dedication and sensitivity in assisting you in making your claim. Employees who carry out manual work are often subject to a variety of risks. Therefore, employers are required to provide employees with sufficient protection against those hazards. Where an employer has failed to do so, or has done so inadequately, and the manual employee has suffered injuries as a result, a claim for compensation may arise. If you are a manual worker who has been injured during the course of employment due to insufficient protection provided by the employer, you may be entitled to make a claim to compensate you for your injuries. If you or someone you know has been a victim of any of the above accidents at work, please do not hesitate to contact Bloomsbury Law’s personal injury team who will assist you. Our team have a high level of experience and work with your best interest at heart. We strive to ensure you receive the best possible outcome. It does not matter how minor or major the injuries are, we are happy to assist you to ensure you are compensated for it.